Commemorating 37 years of successful tank deliveries, NASA and Lockheed Martin Space Systems Company held a ceremony on Thursday, July 8, 2010 at the agency's Michoud Assembly Facility in New Orleans to roll out the final external tank for the last space shuttle flight. Full Story. NEWORLEANS ? The huge external fuel tank for NASA's final space shuttle mission was prepared for delivery to its Florida launch site Thursday, accompanied by a brass band andhundreds of handkerchief-waving workers celebrating its completion as the U.S. space agency winds down its 30-year shuttle program. Lyingon its side, the 154-foot (47-meter) fuel tank was rolled out of its processingcenter here at NASA's Michoud Assembly Facility to a waiting barge for the 900-mile(1,448-km) sea journey to the Kennedy Space Center in Florida. "It'sa bittersweet day for us, literally," said Mark Bryant, vice president ofthe External Tank Program for Lockheed Martin Space Systems. "It's toughto see this last production tank here, but boy do we have a lot of pride to getit here." Theshuttle fuel tank, designated External Tank-138 (ET-138), is slated to fly withthe orbiter Endeavour?s STS-134 mission currently scheduled for no earlier thanFeb. 26, 2011. It is set to be the 134th tank to be flown in the 37 yearsthat NASA and its contractor Lockheed Martin have been developing, assemblingand processing tanks at Michoud. NASA'sspace shuttle fleet has been flying since April 1981 and is set to retire aftertwo finalshuttle missions. Before Endeavour's final flight, the shuttle Discovery isexpected to launch on Nov. 1. 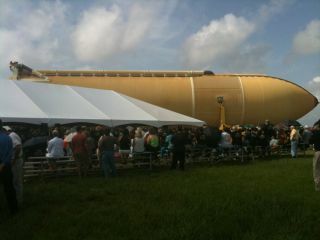 Apacked crowd of Michoud workers and dignitaries gave the space shuttle fueltank a rousing send-off. TheStoryville Stompers, a traditional area brass band, joined the employees as thetank rode atop a wheeled transporter on its 1 mile-trip to the dock and itswaiting barge. Among the assembled crowd were space shuttle program managerJohn Shannon and astronaut Mark Kelly, who is slated to command the mission onwhich the tank will launch. "Ithink most folks just think of the [external tank] as an empty fuel tank andit's really a lot more than that," Kelly said. "It's is a complicatedpiece of hardware and I'm amazed that it works so well every time." NASA'srust-colored shuttle ?gas? tanks hold the 526,000 gallons (nearly 2 millionliters) of super-cold liquid oxygen and liquid hydrogen propellant for theshuttle?s three main engines and serves as the ?backbone? for the spacecraftduring launch. They are covered in foam insulation and plumbing lines to funnelpropellant into a shuttle's engines. This last tank to fly was completed onJune 25. Theexternal tanks have undergone several enhancements over the last three decades,first to lighten them to what NASA now calls its super-lightweight external tanks,and then to increase safety and reliance following the 2003 loss of spaceshuttle Columbia. The firstshuttle fuel tanks were white, painted for insulation and heatingprotection, but NASA soon did away with the paint to save on added weight. Columbia'sheat shield was damaged during launch by a piece of falling fuel tank foam,leading to the loss of the shuttle and its crew during re-entry. Since then, NASAinstituted new quality procedures for foam application, added cameras to thetanks to record any debris shed during liftoff, and inspects the tanks exhaustivelybefore each flight. The goal is to make each tank better and safer than thelast, NASA and Lockheed officials have said. Joanne Maguire, executive vice president of Lockheed MartinSpace Systems, called the new tank "the best fuel tank Lockheed has everdelivered to NASA." Kellyand his space shuttle crew agreed. "Inour office, we have every confidence that every single tank is the best tank,"Kelly said. "It's as good as it can be." Endeavour'sET-138 fuel tank will be towed on a six-day trip from Louisiana to Florida bythe MV Freedom Star, one of two NASA ships used to recover the shuttle?s twinreusable solid rocket boosters after every launch. Thejourney is not expected to be hampered by the ongoing oil spill in the Gulf ofMexico. Forthe previous shuttle fuel tank (ET-137), NASA needed to work with commercialship operators to tow the tank?s Pegasus barge from Michoud to Gulfport,Mississippi, where the Freedom Star was waiting, unable to traverse a moreshallow-water detour aroundthe oil slick. For ET-138?s shipment, Freedom Star arrived at Michoud lastSunday. Onceat the Kennedy Space Center, the fuel tank will be moved into the VehicleAssembly Building (VAB), where it will undergo final processing and await beingmated with two shuttlesolid rocket boosters and the orbiter Endeavour. Hereat Michoud, work is still being completed on one additional external fuel tank,ET-122, which was damaged by falling debris during Hurricane Katrina in August2005. It is being restored to flight configuration and is scheduled fordelivery to Kennedy in late September to serve as the ?Launch on Need? tank forshuttle Atlantis, should Endeavour?s STS-134 crew need emergency rescue duringthe mission. NASAis also considering adding that contingency flight to its manifest ? extendingthe shuttle program by one mission ? to further support operations aboard theInternational Space Station. Ifthat flight is approved, then the current proposal would be to fly the repairedET-122 tank with Endeavour on the STS-134 mission and have ET-138 still flywith the final space shuttle mission, NASA and Lockheed officials have said. Shouldan extra shuttle flight be approved, NASA would likely launch the mission on acargo delivery flight to the International Space Station in the summer of 2011,shuttle officials have said. POLL:Should NASA Retire the Space Shuttles? Click here for more photos of the External Tank-138 rollout and delivery from collectSPACE.com.